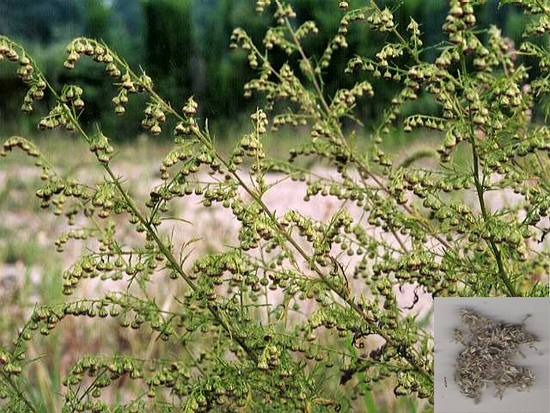 Common Name: Capillaris, Oriental wormwood. Part Used & Method for Pharmaceutical Preparations: The young shoots are gathered in spring, when they are three inches high, and then dried in the sun. Meridians: Spleen, stomach, liver and gall bladder. 1. Jaundice: a) damp-heat yang jaundiceOriental wormwood (Yinchenhao) is used with Capejasmine (Zhizi) and Rhubarb (Dahuang) in the formula Yinchenhao Tang; b) colddamp yin jaundiceOriental wormwood (Yinchenhao) is used with Prepared aconite root (Fuzi) and Dried ginger (Ganjiang) in the formula Yinchen Sini Tang. 2. For eczema and sores with itchiness, it is decocted in water for an oral dose or used for topical application. 3. It is now used to treat hepatitis, cirrhosis of the liver, and cholelithiasis. 4. It is used with Fructus Mume for biliary ascariasis. Dosage: 10-30 g, decocted in water for an oral dose. Appropriate quantity for external application.